If you choose the right type, concealer can be a great asset to your makeup bag and cover a multitude of skin imperfections. If you get it wrong, however, it can make you appear older than your years. There are many concealers on the market and you don't need to spend much money. The key is finding one that suits your skin needs. As a general rule for mature skin, opt for a creamy liquid concealer that will blend easily and only go one shade lighter than your skin. Secondly, try to keep your coverage light. Use a lightweight foundation and set it with a dusting of loose translucent powder. This will create a natural look. Select a foundation with light-reflecting particles to achieve a radiant and more youthful glow. Do not be tempted to apply a lot of makeup in an attempt to hide the signs of ageing, because it will only accentuate them. A heavy base can be ageing and pressed powder will settle into any lines in the skin, drawing attention to them. In this instance, less is definitely more. Once the base is right, you need to build upon it. As part of this process, you should attend to the eyebrows. Thick eyebrows are usually associated with youth and loss of eyebrow definition is one of the tell-tale signs of ageing. Do not draw harsh lines, as they will look artificial. The aim here is to enhance what you have, not to create something new. If you are not used to working with an eyebrow pencil, it can take a little bit of getting used to. It is a good idea to spend a bit of time practicing at home, before heading out. Moving on to the cheeks, cream blush is better than powder for mature skin. A cream will create a dewy, natural finish whereas powder can make the skin look dull and dry. By applying a pink color to the apples of the cheeks, you will instantly create a flushed and altogether more youthful look. Do not use blush to contour the cheekbones, as this can result in a gaunt appearance when you want to create the illusion of plumpness. Finally, the lips deserve a mention. As we age, our lips tend to thin. Use a lip pencil to outline the lips and add definition, but do not go beyond your natural lip line. And as with the eyebrows, take care to avoid harsh lines. Lip gloss can effectively plump up lips, so do not be afraid to add gloss over your lip color. And do not forget to smile; it will make you feel and look younger. This look is stable in South Korea where it originated from. It gives your skin a youthful, glowing appearance. Apply moisturizer generously and use it with non-matifying foundation. Also, put some highlighter on your cheekbones for a finished look. Treat with products containing high amounts of antioxidants, sheer and lightweight moisturizers, and other beneficial skin ingredients that brighten your natural skin complexion and plump up your skin. Add a light lip color and a subtle blush. If your eyebrows need some work, shape it up and if not, leave it as it is. Even if you have a busy life, you will still be able to look younger with just a few changes to your makeup routine. But remember, the fundamental aim is to draw attention to your best features and minimize the appearance of those tell tale signs of ageing. Be careful not to mix up the two. I found it very useful. I think there were a lot of new ideas with weight loss. I think we should not take everything you wrote to heart. You are just supplying us with new or different ways to take care of ourselves. Good for you. Thanks, for the tips. I don't feel like this is perpetuating insecurity. We all have flaws and some of us want to correct them. I found the information helpful and useful. P.S. I follow you on youtube. Keep up the good work. IF has helped me lose and get healthier thanks to all the information you shared. Stop perpetuating meaningless insecurity for women that is harmful. 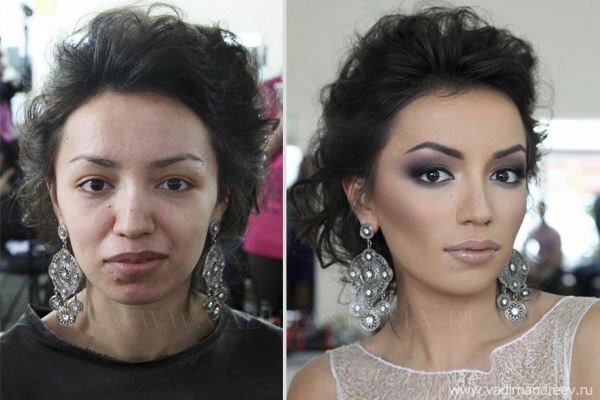 Personally, the amount of makeup these people have on constitutes as a mask and they’re actual faces look perfect. Also, stop buying into the unnecessary stigma towards the natural process of aging. excellent and exciting info . Thought I knew but really do not know but know now what to do to stay looking younger!!!!! Hard to age gracefully but I'm doing it!! !